PriceAdvantage will enable Casey’s to implement a centralized pricing strategy that utilizes data-driven pricing rules and price optimization capabilities. PriceAdvantage, a fuel price management and price execution software company and division of Skyline Products, announced today that Casey’s General Stores, Inc. has selected PriceAdvantage software to help improve overall fuel sales and gross profit dollars. Impact 21, a leading consultancy in the convenience industry, defined the requirements, coordinated the RFP process and analyzed the results that led to the selection of PriceAdvantage. PriceAdvantage will help Casey’s move from a decentralized pricing strategy to a data-driven, centralized strategy that will identify price and volume elasticity to provide greater correlation regarding the impact of prices on fuel demand. The software will provide transparency to the entire Casey’s fuel team – from district managers to corporate fuel pricing analysts – by establishing pricing rules and strategies for specific commodities at each store. Additionally, Casey’s will utilize a mobile app to support streamlined competitor insight and allow district managers to make immediate market adjustments. To learn how PriceAdvantage can help your fuel marketing team, Request a PriceAdvantage software demo. PriceAdvantage creates Software to Fuel Your Pricing StrategyTM. Our easy-to-use, highly configurable, patented solution allows fuel marketers to execute their unique fuel pricing strategy faster and more accurately by reducing manual processes and human errors. PriceAdvantage enables customers to make rapid, informed fuel pricing decisions based on their unique business rules, then automatically post new prices to their POS systems, fuel pumps and price signs, and then receive price change confirmation – all in just minutes. PriceAdvantage is singularly focused on fuel pricing software and is a division of a privately held U.S. company, Skyline Products, which produces software solutions and thousands of American-made electronic price and transportation signs annually. Learn more at www.PriceAdvantage.com. About Casey’s General Stores, Inc.
Casey’s General Stores, Inc., headquartered in Ankeny, Iowa, owns and operates over 2,080 convenience stores in 16 states. The stores offer self-service gasoline, a wide variety of grocery items, and prepared foods, such as made-from-scratch pizza and donuts, chicken tenders, and made-to-order sub-sandwiches. 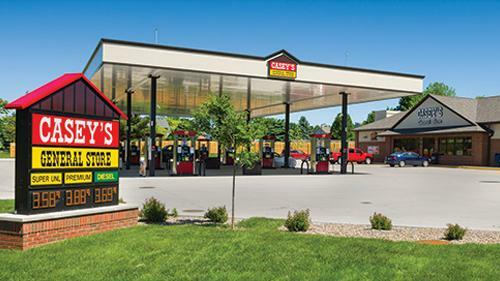 Casey’s owns and operates two distribution centers, delivering approximately 90% of in-store products as well as approximately 75% of the fuel sold at their stores.